Preheat oven to 375 degrees. Grease a 9x13 casserole dish or cake pan. Set aside. Place all crumble ingredients, except the walnuts, into the bowl of a large food processor. Pulse until mixture becomes sticky. Press ¾ of the mixture into the bottom of the 9x13 pan to form a layer. Place food processor bowl with remaining mixture back onto the food processor base and add walnuts. Pulse until walnuts are chopped and mixture remains sticky. Set aside. In a medium mixing bowl, stir together blueberries, lemon juice, sugar and corn starch. Pour blueberry mixture onto the bottom layer. 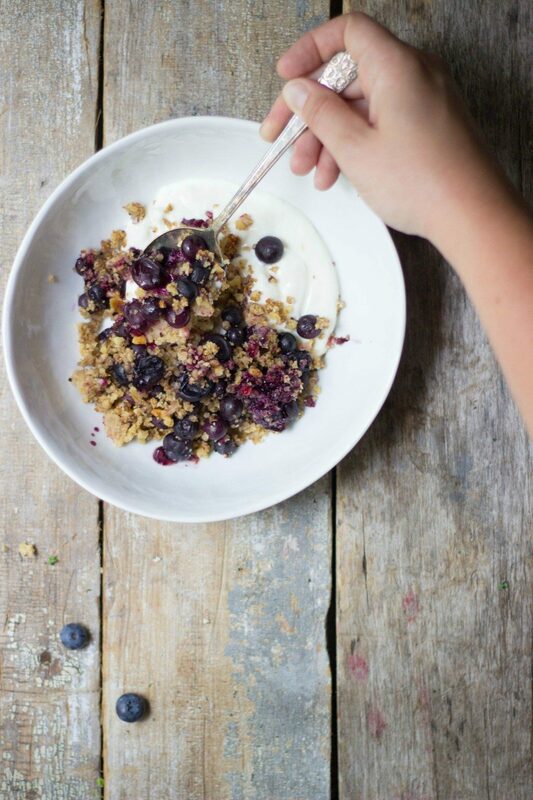 Sprinkle the remaining oat/walnut mixture onto the top of the blueberries. Bake 40-50 minutes, until blueberries start to burst and topping is slightly browned. Serve over yogurt or with ice cream.